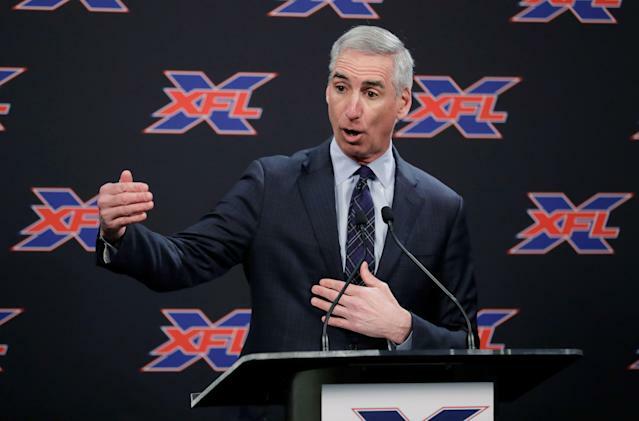 The second incarnation of the XFL is slated to begin play in 2020, and the league has been announcing the head coach/general managers who will be in charge of the eight teams over the past few months. It was nearly a year ago when Oliver Luck was announced as CEO and commissioner of the upstart, and has been making the media rounds of late. Luck is, in part, explaining how the XFL will succeed despite the recent flame-out of the AAF. Part of it, Luck believes, will be quarterback play. Appearing on Cleveland’s “The Ken Carman Show With Anthony Lima”, Luck said the league will pay higher salaries to quarterbacks than other players (the average player salary will be $75,000, but quarterbacks can earn up to $300,000), in the hopes that the XFL can draw talent at the position. “Think about what Matt Ryan said during the Super Bowl that really resonated with me: he said that all the rule changes in the NFL have certainly helped the offensive side of the ball. But he also said the rule changes have allowed quarterbacks to play longer. You’ve got guys like Eli [Manning] and [Philip] Rivers and Ben [Roethlisberger] playing 17, 18, 19, 20 years and they are occupying those spots. Where would that extra money for quarterbacks go? Carman asked Luck about two quarterbacks currently out of work: Johnny Manziel and Colin Kaepernick. Manziel faced misdemeanor assault charges in 2016, accused of striking a former girlfriend, but those charges were dropped after he reached a plea deal. “Well, you know, he’s had an interesting career,” Luck said of Manziel. “As long as he fits our profile, and our sort of behavioral standards, and quite honestly, a bigger challenge – as long as our eight head coaches think he’s one of the quarterbacks that can make us better, and we’ve got some guys that know quarterbacks fairly well, whether it’s Bob Stoops or Pep Hamilton, Jim Zorn – we’re going to rely heavily on our coaches to say, yes, these are the guys that will make our league better. While Luck seems open to having Manziel play in the XFL, he seemed cooler on the idea of Colin Kaepernick on a roster, and reverted to tropes that have been debunked dozens of times. “I have no idea whether Colin’s in shape or not, whether he wants to play. We’re a league that has salary restrictions, and obviously based on what people have said might play a role in his desire to play,” Luck said. Those closest to Kaepernick have said numerous times that he’s in shape, and working out as many as six days a week. Also, Kaepernick still has an agent, who could likely be reached to ask what the former San Francisco 49ers quarterback has been doing. Kaepernick reportedly request $20 million to play with the AAF, in part because he would have been a draw for the league, and also because it’s around what he’d make as an NFL starter.